Let’s look at the four-hour chart. Tenkan-sen line is below Kijun-sen, they are both horizontal. Chinkou Span line is below the price chart; current Kumo-cloud is descending. The pair is still falling, Tenkan-sen line (0.9338) is the closest resistance level. One of the previous minimums of Chinkou Span line is expected to be a support level at (0.9265). In general forecasts for Euro are not encouraging. While reducing public expenses, Italian government accumulated huge debts. Debts to the private companies have reached about 75 billion euro. Finance Minister of Italy, Pier Carlo Padoan said that the problem will be resolved before the end of this year. However, previous promises offered by Prime-Minister Matteo Renzi have not been implemented. Last Friday the pair GBP/USD demonstrated poor dynamics, since, following the decline on Thursday the pair remained almost at the same price level. Preliminary British GDP has grown by 0.8% in Q2, which was correctly predicted by experts. At the beginning of this week the currency pair GBP/USD continued downward correction: the quotes fell to the level of 1.7041, almost reaching the bottom moving average of the Bollinger bands. According to the latest data British economy demonstrates stable growth; therefore, the Pound is likely to strengthen in the long-term. It is expected that GDP growth can reach 3.1%. Experts explain such rapid growth by the increase of investments by 12.5%. On the four-hour chart Tenkan-sen line is below Kijun-sen, both lines are horizontal. Chinkou Span line is below the price chart, current cloud is descending. 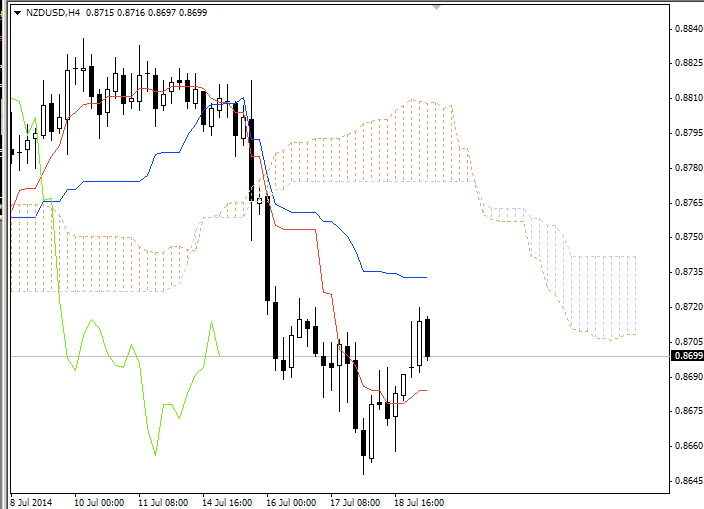 After long fall the pair has been corrected above Tenkan-sen line, which becomes a support level (0.8684). The closest resistance level is Kijun-sen line (0.8783). At the first half- week European currency was under strong pressure from investors, while the USD was strengthening due to the positive data on the US inflation. Unexpected increase of the inflation pressure in the USA instills more confidence to the market participants. Following long-lasting ascending movement the price of gold dropped to the level of 1302.98. The decline in gold price was caused by the profit taking. At the moment the pair XAU/USD is under pressure from the U.S. economy, which is increasing growth rate. Analysts anticipate that the interest rates will be raised earlier than expected, which will significantly drop the price of gold. On Monday the currency pair EUR/USD demonstrated mixed trading. In the morning the price had reached resistance level of 1.3640, after that, the price corrected to support level of 1.3614 (middle line of “Bollinger bands” indicator. At the moment the pair is traded near this level. Due to lack of important macro-economic news yesterday the pair was quiet, slowly going up to resistance level of 101.80. Although the market was in anticipation of the minutes of the FOMC meeting, they did not seriously affect either the market, or the pair. At the opening of the European session today the pair continued to decline. At the moment the pair is testing support level of 101.30. Following significant decline last week, the pair Euro/USD tried to win back losses at the beginning of this week. However, after the slight rise the pair went down due to favourable data on the US NFPR. This morning the pair traded in the narrow range prior to the release of the minutes of the US FOMC, which investors are waiting with big interest.